Thank you very much to those of you who've participated and sent me weaves. The rest of you can go Potter Stewart yourselves. If this is unclear, mail me with the unclear part, and I'll try to fix it. IMPORTANT: Use large rings. I've tried it with 16 gauge wire (5/16" id) it doesn't work. With 17 gauge wire, you NEED 5/16" ID. 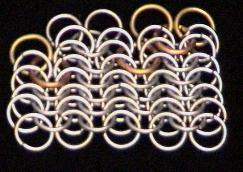 This is a box pattern consisting of 10 rings. It is best to have it look like the box, and not in any of the other ways this ring combination will rest. It keeps the center of EPQ as it is shown below, looking like an arrow (=>), and not layered (//). The weave just looks more even, I think. add the last four. There should be 'empty' spaces to fill in. I won't go into how to start the persian. I can't do it perfect every time. 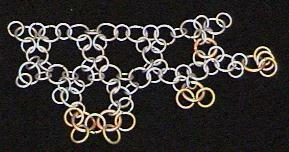 Just tuck in the loose rings in the box weave. Play with it. This is how you continue it with 2 open rings, 2 closed rings. The copper are the open rings, the brass are the closed. Half persian - don't add one of the open rings. Oriental Open Hexagon pattern.. or another Oriental 4 in 1.
there are 2 ways to construct this weave.. you can make 2 strips of chain and 'zip' them up or you ca build directly on to it.. the strips look like the other oriental 4 in 1 weave. This is easiest if it is a solid color or metal.. The other way to make it is to build on o the edge.. the upper two examples are for the zipping method.. the lower two are for the adding on method. I'm not quite sure what else to say, so I'll shut my face. there are two ways to do the 4 in 1 european weave, as well.. here are examples of both.. if you make strips you need to 'zip' them up. almost just like the 4 in 1, but you weave two rings back instead of one.. you can extrapolate this to make 8 in 1, 10 in 1, 12 in 1, 232 in 1.